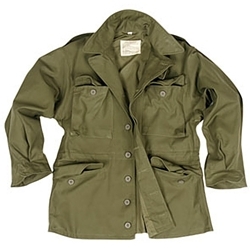 Our U.S. GI M43 Field Jacket WWII Reproduction is an accurate replica of the later version 43 field jacket. This jacket includes 4 front pockets, collar tab and buttons, shoulder epaulets, 6 front buttons, drawstring waist and clothes at wrist. Olive. Hand washing recommended. Order by your chest size, in inches. Material is 100 percent cotton.